Alastair Reynolds has been a contemporary science fiction author on my list of writers to check out for a while. It was near the end of Christmas break that I visited my local public library and grabbed a small pile of novels that included Swanwick, Moorcock, and Benford, and a very thin volume by Reynolds. 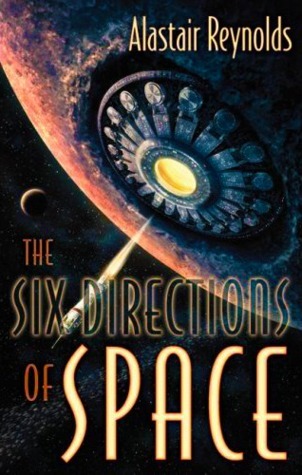 The Six Directions of Space, like The Very Best of Michael Swanwick, was published by Subterranean Press (one of a signed run of 1000), but unlike the Swanwick, it was a disappointment. From everything I hear, Reynolds has done impressive contemporary science fiction, but The Six Directions of Space, though a quick and easy read (actually a novella in hardcover), is not among this. Sign into Goodreads to see if any of your friends have read The Six Directions of Space.